SUMMARY: One B2C company relied solely on repeat customers and referrals since the year 2000 to grow its business. Growth was reliant on "organic" leads with "no real strategy behind growing leads [and] growing the business," Jessica Carstens, Marketing Manager, Cartelligent, said. To begin to grow leads outside of repeat customers and referrals, Cartelligent revamped its content process to optimize for SEO and engage new customers. 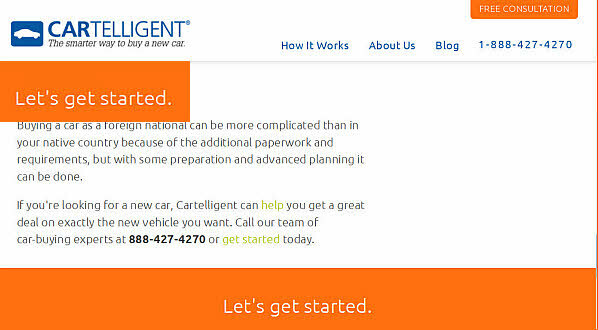 Cartelligent helps its customers buy or lease any new car, outside of working with a dealership. Using other common online car shopping sites, Carstens explained, customers' information is sold to a dealer who will honor a pre-set price, but nothing about leasing, financing or trade-in values is arranged. "What we do instead is we give you a real live person who knows a lot about cars who walks you through the whole process, gives you advice, helps you decide, which car's going to be best for you. Then once you decide that you want to use us, we go out, we negotiate a great price," Carstens said. 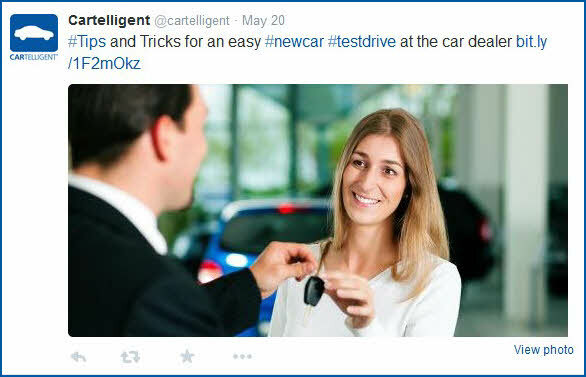 Since Cartelligent buys a lot of cars, they receive volume discounts and take advantage of incentives and rebates, passing those on to customers. Once the process is complete, the customer comes to the Cartelligent office to pick up their new car. "You never have to set foot in a dealership. You never have to do that back and forth, 'Let me talk to my manager,'" she said. 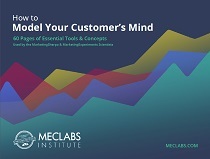 Carstens' biggest challenge in customer growth is that people don't naturally think a service like Cartelligent exists. "You have to interrupt them in their day-to-day life or in the car-buying process and say, 'Hey, here's something you hadn't considered, but it's pretty cool. Why don't you check it out?'" A year ago, Carstens faced the additional challenge of launching Cartelligent's new website. "We put a lot of time and effort in, we had kind of an old, outdated site that I'd inherited when I started. It had a lot of pictures of cars, it didn't really do a good job of saying, 'This is what we do and this is why you want to use us,'" she said. Wanting to bring in new leads, the company needed a website where people could come and understand the process, as well as establish trust. "Once we had the new website up, we knew that one of our focuses was going to be obviously SEO. That was a big part of what we put into URL structure and all of the stuff that goes into a new website," she said. Carstens knew that spending more time developing inbound content would be a big step, both with SEO and developing customer trust. "We'd had a blog on the other website, but … it was old, it was outdated. It didn't do a good job, so we weren't putting a lot of effort into driving people to it," she said, adding that with the new website, "our big focus is — we've got this beautiful new thing, how do we get people to it? How do we get people interested in our service?" 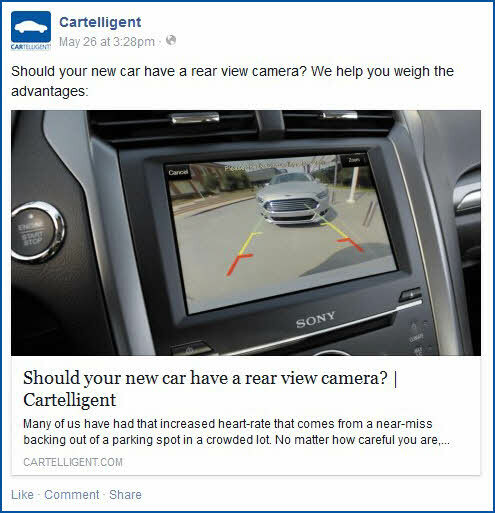 Carstens began putting together content about car buying, publishing once or twice a week instead of the once a month Cartelligent had been doing before. She was also inserting keywords to build up SEO into old and new content. I'm at the end of my lease. What do I do? What are the tech features I should be looking at? What are the top 10 family cars? I'm looking to trade in my vehicle. What do I do? "We put together a lot of content along those lines that people will find on search and then, hopefully, they're on the article, saying, 'Hey, this is good, helpful information,'" she said. Besides Google search topics, Carstens also gets blog post content ideas from customer-facing employees. "A lot of times, the account executives will come over to me and say something like, 'I've had a lot of people come and ask me about blind spot monitoring. That seems to be a hot button. That might make a good blog post,'" she said. There is also a small paragraph at the bottom of each article that encourages the reader to seek a consultation with Cartelligent, to either begin the process or learn more about that particular issue. Once the new website was up and running, Carstens said she had "a lot more free time, [so I] really focused on making sure that we were constantly putting out content. We've got a little media calendar which has … some topics that we tend to do more with, some ideas, things we want to focus on. Carstens does all of the writing for the blog posts, but she utilizes resources to help her know what to cover, and to inform herself further on topics. For example, if she is writing a top 10 list, she pulls up what cars are most popular with customers and Carstens will also pull in people who know more about specific topics. "If I'm writing something about trade-ins, I'll pull in a trade-in manager to help me put in some specific knowledge that he knows that I don't," she said. From there, other staff members will review every blog post for fact and spell checking. Once a blog post is published, Carstens sends it and the others published that month out through the monthly newsletter. "If you look at the website, there's not a lot of content on each page. It's more white space visual. So the blog is really the main place where we can expand on the keywords, and really use them in context and get good information about them," she said. Carstens began addressing SEO issues with older content by going through all the previous blog posts to update and optimize them. "The content for the website was all from scratch ... The blog posts that we had on the old site, we moved over, so those were repurposed content," she said. Once content was created, or moved over from the old website, Carstens wanted to go through it and make sure it was full of specific keywords Cartelligent wanted to be associated with. "We spent a lot of time on the URL structure. We spent a lot of time going through the content, seeing if there [were] any opportunities to put in some of the keywords that didn't come to mind as organically," she said. Carstens gave the example of "online" and "lease" as being two keywords Cartelligent has worked hard on. "If you look at our organic search — what the landing pages are — there's a lot on the homepage, which is fantastic. I love the homepage. We convert, obviously, the best for people who go to the homepage. But we also convert pretty well for people who go to the blog posts," she said. "We love people who search for Cartelligent. But now it's a lot more of less brand-specific keywords that are driving people to the site, and that tells me that everything's working and that everything that we're doing is getting people who hadn't heard of Cartelligent but were looking for a way to buy a car or something about car buying to our website," she said. Carstens also does content remarketing on Facebook, LinkedIn, Google Plus, Twitter and StumbledUpon, as well as using Google AdWords so that anyone who has been to the website and is in the target area – which is very focused on California — keeps seeing Cartelligent for the next 30 days. "Hopefully if you see the blog post, whether or not you decided that it was the best thing ever at that moment, Cartelligent's going to stay [at the] top of [your] mind so that at some point, you're going to say, 'This is really worth looking into,'" she said. About using StumbledUpon, Carstens said, "We get fewer conversions from it, but it's a nice way to get people who are interested in reading more about car buying. It just gets a nice traffic spike to the posts in the first few weeks that it's up." Outside of social media, Carstens said she gets more responses to the monthly newsletter that goes out to customers, which heavily features content. "People write back and say either, 'Thanks for the article. I really appreciated this,' or, 'Have you thought about doing something else?' So that's always nice — when we get actual feedback from customers about what we're writing," she said. The newsletter has one featured article — which alternates between a top 10 list and a car-buying information article — as well as smaller articles that have been posted throughout the week, and one or two Yelp reviews. 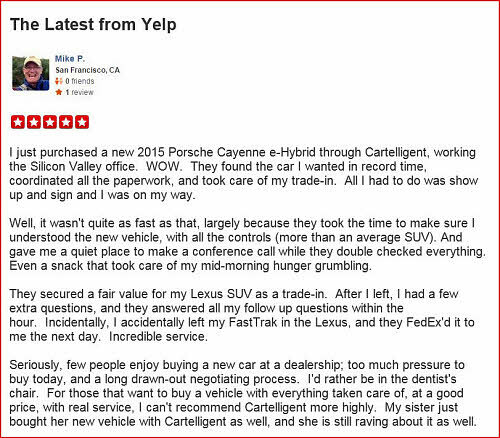 "We have … almost 250 five-star Yelp reviews across the five branches. So it's a service that people really love and appreciate," she said. Including the Yelp reviews helps to build trust and "we wanted to have people who weren't me or Cartelligent talking about the company," she said. Cartelligent sends an email to people who take a post-sale survey and rank the service highly, asking them to take the time to write a Yelp review. "We do ask, but we don't push people who don't normally write Yelp reviews to do one," she said. "I think it's obviously a combination of everything, but I think the content has helped dramatically," Carstens said of the success the company has seen recently. "Web search leads went from the number three source of new leads — so not repeat or referral — to the number one source of new leads over the past three months," Carstens said, "which is a pretty big milestone for us." What Carstens said Cartelligent has found works for it in inbound marketing is that "going back to the beginning isn't about something that people are looking for, but finding a way to get them to discover it on their own." It has been a fairly large time investment, she said, but "it's definitely something we're seeing a return on." "Obviously the organic search growth is huge, because that's something that will just continue to build on itself as we continue to grow our content library. So it's definitely something that we feel has been very successful for us, and that we feel we need to continue to pour time and resources into," Carstens concluded.